Kimberly Hocking. Photo courtesy of Jeremy Dodgen at Dodgen Photography. The Seventh Biennial Mid-City Studio Tour is taking place this weekend and will showcase the work of local artist professionals in a variety of media, over the span of two days. Artists will open their work spaces to the public, allowing a rare glimpse into the processes and materials they use to create. Featured artists include: Kristine Baker, Slater Barron, Caryn Baumgartner, Sheriann Ki Sun Burnham, Dorte Christjansen, Cynthia Evans, Moira Hahn, Betsy Lorher-Hall, David Hocking, Kimberly Hocking, Nate Jones, Connie DK Lane, Tini Miura, Kimiko Miyoshi, Pia Pizzo, Bob Potier, Dawn Quinones, Carol Roemer, Sue Ann Robinson, Joan Skogsberg Sanders, Kumi Steffany, Craig Cree Stone, Annie Stromquist, Gail Werner, and Jaye Whitworth. 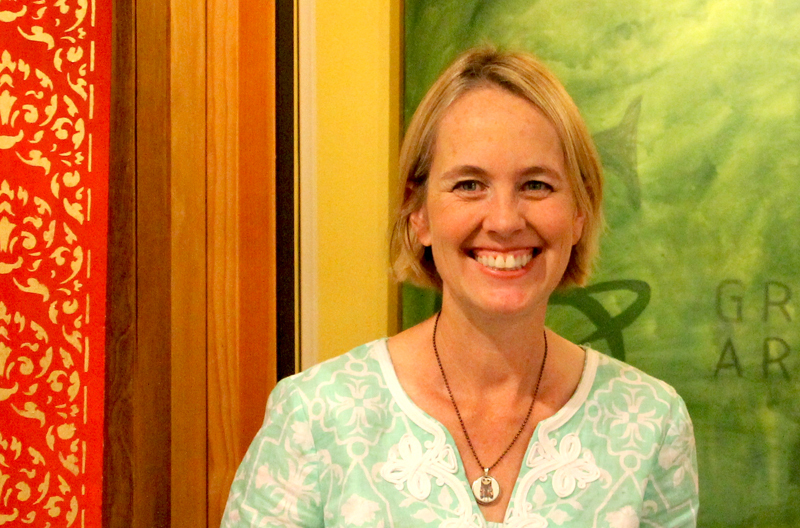 Kimberly Hocking is the co-founder of Greenly Art Space, which serves as a gallery and gathering spot for many local artists. The space is tucked away in an industrial park. It will be featuring work by several of the tour’s artists in addition to its current exhibition, BLUE. Hocking did graduate work at Loyola Marymount University in Art Therapy, which furthered her growth in seeing art as a mechanism to encourage healing, and to build community. Long Beach Post: What was the impetus for opening Greenly Art Space? Kimberly Hocking: My best friend moved to Africa and began working with the poor there. We conceived a project titled ‘Broken-Beautiful’ in which youth from Sierra Leone and Seal Beach took photos of images that spoke to them of these concepts. This was the first show I curated and put up at a local church. The stories that were told about the images helped the individuals here to see life from another perspective. I decided, after this, that I wanted to start a community gallery to continue this effort. We have a weekly lunch for artists where we bring our lunches and share about our art and our weeks. We have an Open Studio group where a small group of artists meet to create art with intention and share about the meaning behind this. How does the Art Space build community, and do you have specific goals or expectations in this regard? I believe that Greenly builds community in many small ways, and that it is built slowly, over time. I think that having artists show their work in group shows, creating openings where friends and family can see the work, and having smaller events like the lunch and open studio all help to create community. I am learning, as I go along, what it means to build community through art. It is about sharing our lives through our art, and also about the volunteers who serve at the space so that Greenly can exist. What kinds of synergies have you observed arising from these activities? We all want to know that we are not alone in our struggles in this life and, as these groups have been consistent over the past four years, there is a waxing and waning of people who come and go. There now is a small core group for each. As with all of life there can be misunderstandings or challenges, but the underlying care, honesty and dedication to art have created groups in which there is a high degree of trust and kindness. What kinds of creative collaborations have resulted? Two years ago, a group of artists began talking about the idea of art as an act of contemplation and prayer. We came up with the idea to have a group of artists (eight in all) meet over a period of two months once a week to each create an art piece as an act of prayer. The artwork that came out of this collaboration became an art show titled “Sacred Creativity” which invited the public in to witness the end product of our weekly acts of art as contemplation. Another creative collaboration came about with two artists who got to know each other through the lunch. One had never had an art show before, and the other had not shown his art in a number of years. They created a show together, his with mixed media work and hers with photographs. They each encouraged each other during this process of putting their artwork in the gallery for others to see. Woman With Wings by Kimberly Hocking. Photo courtesy of Jeremy Dodgen at Dodgen Photography. How has your work at the Art Space influenced your own creative work? Because the formation of Greenly Art Space is something new, I have sought to explore what it means to create work that is about contemplation. Over the past four years, I have made trips to a local monastery to make art and to consult with a monk about the formation of the monastery. During my visits to the monastery I took many walks in the moonlight where I captured ethereal landscapes that explore the idea of the mystery and beauty of life. As part of my art practice at Greenly I create small works of art as prayer that I often give to others or share with those I pray for. 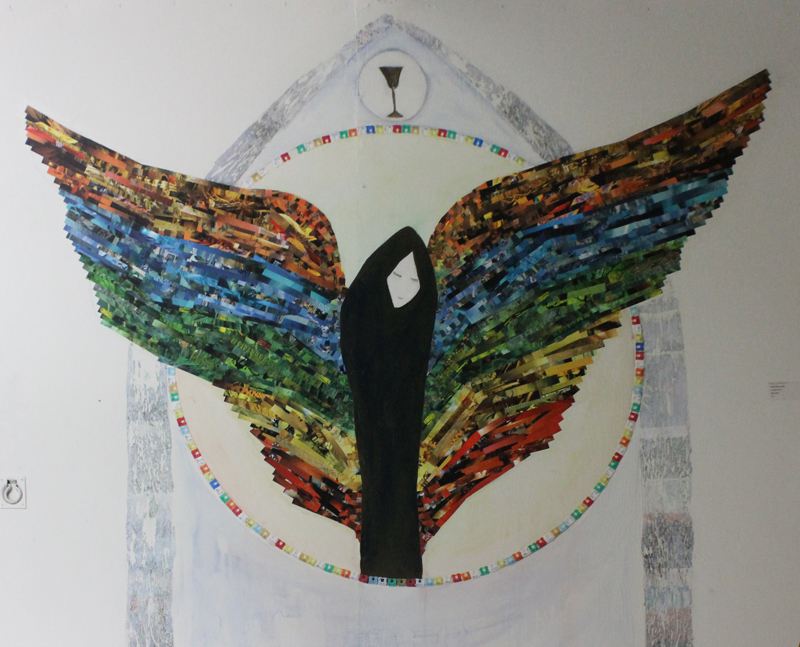 I have also created larger pieces that continue to be a part of the fabric of Greenly, such as the woman with wings who looks down over my desk and is a reminder of the prayer for those in pain that I created during the Sacred creativity show. I have also continued to create sculptural work such as my ‘the last straw?’ piece, created with straws collected from Long Beach’s beach over a number of years. I am inspired to create much as other artists are by the topics of our group shows. Sometimes it is difficult to find time to make work, but I think that it is an important part of what I do, to be true to my calling as an artist. As I do this, I find I can better encourage other artists in their creative vocation. How has your training as an art therapist shaped your own work, and your approach to curation? As an art therapist, I was trained to look at the metaphors and the stories behind the art. The process of listening to another individual tell their story through images is a powerful one. For example, during my internship with the Long Beach Unified School District, I had a client [who] was quadriplegic. We worked together for him to learn to paint with his mouth, to mix colors, and to tell his story through images. The images spoke a profound story of his re-imagining his life though art. My training shaped my desire to hear the stories of individuals and to find ways to link these stories together to create community. I believe that, when I am curating shows, I am looking for ways for each individual to share their story and for the viewers to experience something that they can relate to their own life. I enjoy creating and curating shows that encourage both artist and viewer to think deeply about different aspects of life that are common to the human condition. I believe that my training as an art therapist gives me insight into topics and art that speaks to the common struggles and beauties in life. It is through sharing these stories that community is created. What are the unique struggles and beauties of operating an art space in a non- traditional venue, in what I’d call an industrial park? Well, there are many of both. When we first started, I was often asked why in the world I would have an art gallery in such an out-of-the-way place. Many people comment of the difficulty of finding the space and we do not have a lot of day to day foot traffic. I think though that our space is ideal for the goals of Greenly, one of which is contemplation. It is quiet up at Greenly, and you can look out at the mountains and the sky and not feel like you are in the city. The name Greenly comes from the idea of nature inspiring creativity, and we were able to create a sense of nature in our front room with the painted trees and paper butterflies. Because of where we are located we have been able to expand our openings to create events, have dances, performance art, sing-alongs, and poetry in the parking lot space which is transformed by luminaries and fabric into an outdoor performance and gathering place. Greenly has become a destination that people have to seek out, but I am finding that more and more people are wanting to come and see our thoughtful and beautiful art shows and to experience the peaceful feeling that I think is enhanced by our setting. 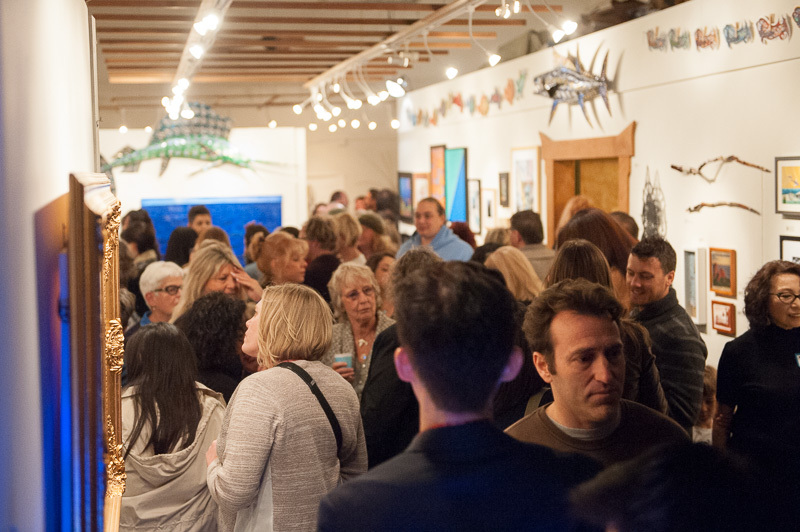 The opening reception for BLUE at Greenly Art Space. Photo courtesy of Jeremy Dodgen at Dodgen Photography. How did your current exhibition, BLUE, come about? For the past two years Greenly has created a large fundraising show in which we can bring awareness to another nonprofit that is doing something to benefit the world. Last year we created a bird show and raised funds and awareness for a bird rescue. One of the artists from that show and I were talking about ideas for this year and happened on the idea of looking at the Ocean and our impact on this great wonder. Emily Brozyna and I started working together on the concept of BLUE. More than 70 artists submitted work for the show, many of these are also on the tour. The ocean is an amazing part of Long Beach, and yet the pollution that we experience when walking on the beach is heart-breaking. Emily and I wanted to give local and international artists an artistic voice to the impact humans are having on the ocean. A portion of the funds we raised at the opening will go to help Algalita. On the tour, individuals can see this show, and artwork of four of the artists in this show—David Hocking, myself, Kristine Baker, and Sheriann Ki Sun Burnham. In addition to the work in BLUE, will there be other work on display by these Tour artists? Yes. People can see the BLUE show inside the gallery and then we will be putting up a booth right outside Greenly, which will showcase more of the artwork of the four artists I mentioned. Our idea was to give room to a few artists without studios of their own to show their work on the tour. Dave and myself also decided to participate as artists, this time, to share more of our personal artwork. There will be multiple pieces by each of the four artists mentioned. What plans do you have for your next show? A young artist named Andres Mentation talked with me about the possibility of creating life-size sculptures for an art show. He has not done this before and was excited about creating sculptural work on this scale. I decided to talk with two other sculptors, Nate Jones and Karena Massengil, about creating a show with Andres. This show will feature the work of these three artists, each at different points in their careers. We will be exploring the concept of becoming an artist, and it should be a very exciting because we will be showcasing the artwork of very accomplished artists along with an emerging artist. It will open in October. It is important for people to think about the ways that we can support artists. There are not many spaces where artists can share their work, and it is a struggle to keep a space like Greenly open. I want to thank all the ‘Theos’ out there who help to support the ‘Van Goghs’ of this world, and help Greenly to continue to exist. I am so grateful to the individuals who give generously to Greenly of their time and resources. We are fully staffed by volunteers, and many people work hard so that each show can go up and be shared with the public. Greenly Art Space is located at 2688 Junipero Avenue, Suite 113, in Signal Hill. Gallery hours are normally Monday, Wednesday, and Friday from 11:00AM to 2:00PM, or by appointment. For more information call 562-533-4020, or visit their website: GreenlyArtSpace.com. This weekend, as part of the tour, the space will be open from 11:00AM to 4:00PM. For more information about the Mid-City Studio Tour, visit MidCityStudioTour.com. To learn more about Algalita, visit Algalita.org.